Field Maintenance Program | Field Maintenance | Turf Tek USA ‹ FREE SAMPLE! An ongoing turf maintenance program is especially critical for sports installations. Important for more than enhancing a surface’s aesthetic look and feel, regular turf maintenance is an investment in field integrity, longevity, and, ultimately, athlete health and safety. Turf-Tek installations are designed to provide a generation of physical pounding and wear and tear— but without a regular schedule of attentive turf care, any artificial surface will breakdown— posing hidden dangers to those who’ve put their trust in the caliber of these playing fields. Turf-Tek encourages facility operators to take advantage of its comprehensive triple-tier maintenance offerings that include inspection, cleaning, revitalization, repair and sanitizing in regularly scheduled facility visits. Care and treatment programs range from “Essential” to “Enhanced”, and, ultimately, “Specialty” treatment options, and cover virtually every service that’s recommended to keep turf surfaces in prime playing shape, and perfectly safe for young athletes. Turf-Tek technicians bring years of observational skill, and expert-maintenance know-how— employing up-to-the-minute treatment regimens, and the latest advances in automated field equipment. Indoors or out, more athletic programs and facilities rely Turf-Tek to keep their playing surfaces meticulously managed, maintained and manicured. Provides the basic necessities and services for debris removal, field de-compaction, infill redistribution and grooming. Provides advanced care and treatment for older athletic fields with typically heavy use. Treatment includes deep field de-compaction, magnet sweeping for metal fragments, fiber revitalization, infill replacement, UV microbial treatment and complete surface vacuuming. Provides additional visits that include both “Essential” and “Enhanced” maintenance coverage, plus custom treatment services based on a need for added surface applications and field maintenance. Regular cleaning of synthetic turf is necessary to maintain clean, sanitary, bacteria-free playing conditions. Satisfactory maintenance equipment is normally used to remove surface debris. However, other debris can remain below the surface that cannot be cleaned with normal equipment. 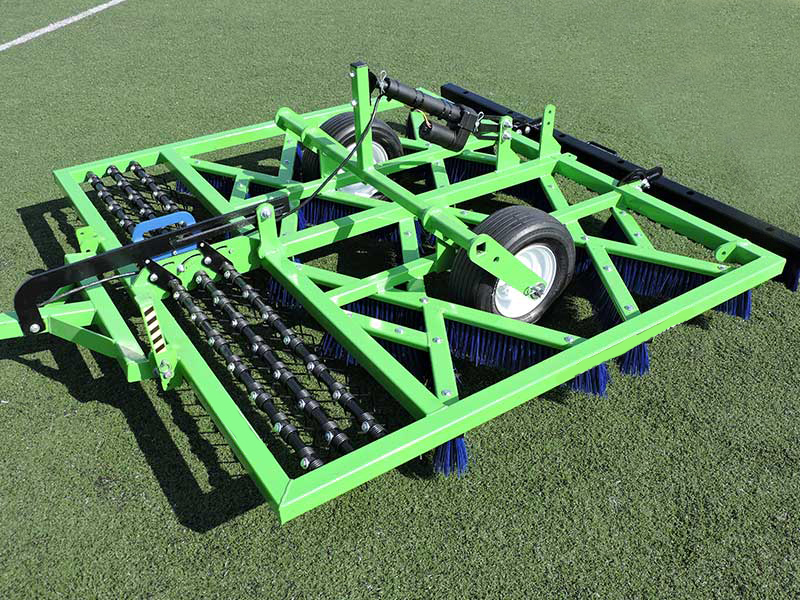 The Verti-Top machine utilizes a rotary brush to remove the top layer of infill from the turf. This process begins the necessary cleaning technique to remove all types of debris, even the fine particles, from the turf. The machine sifts and separates the debris from the infill, and then uses a lag brush to level the infill, leaving a clean, smooth playing surface. The vacuum unit also removes large amounts of dust, hair, and bacteria-filled debris, all while reducing potential allergens in the turf. It’s vital to remove debris from synthetic turf that could potentially cause damage and affect the warranty of your important investment. This can also reduce the operating cost for your equipment and staff. It is important to ensure clean and safe playing conditions. Pathogenic contamination is an inherent fact of life in any athletic environment. More than a health risk, these lurking microorganisms can threaten the financial fabric of businesses, and municipal installations that rely on maintaining, and safeguarding, a clean, and reputable facility. While sanitizing regimens are rarely 100% safe and effective, the Turf Tek system, with UVC coverage, greatly minimizes the risk factors… and without the use of caustic chemicals. Now, athletic-facility managers can aggressively, and safely, eliminate the risks of MRSA, HIV, H1N1, and SARS on every vulnerable surface. UV cleaning and sanitizing from Turf Tek, is simply the most thorough, cost-saving, sanitization method available today.